It’s only its second year but Laver Cup is already creating some fun new traditions like the team-mate introductions made by the players during opening night. Last year at the inaugural Laver Cup in Prague, Alexander Zverev gave us this gem where he recounted the first time he met Roger Federer, when he was just five years old. This year in Chicago, the 1.7m Diego Schwartzman stole the show when he introduced his fellow Team World member John Isner to the stage by describing the 2.08m American as his “twin”. Tournament debutant Novak Djokovic introduced his team-mate Federer by saying: “I am the player that I am today because of him. We played some thrilling matches over the last decade. Please give him a big hand: Roger Federer”. Watch more highlights from the gala in the video above. Laver Cup: Will Roger Federer and Novak Djokovic play doubles together? Last year, the inaugural edition of the Laver Cup gave the tennis world an unforgettable moment when Roger Federer and Rafael Nadal played doubles together for the first time, en route to Team Europe’s victory over Team World at the O2 Arena in Prague. 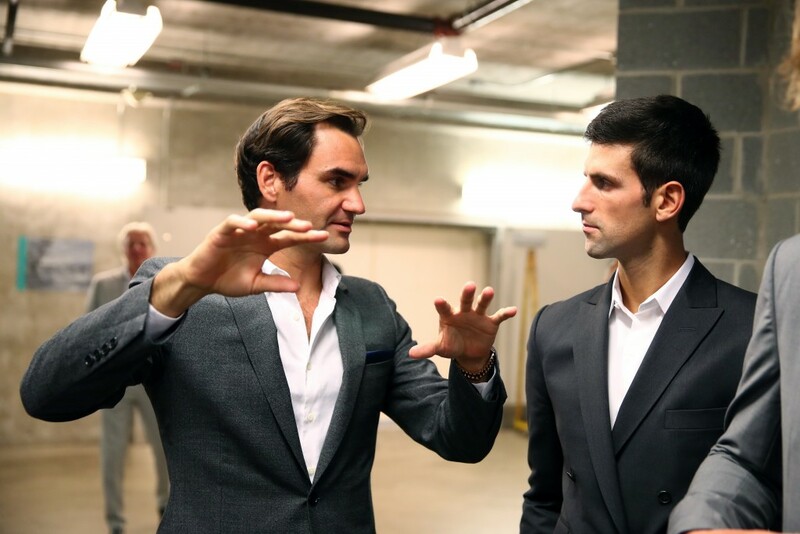 This weekend in Chicago, another dream team could potentially materialise for the first time with Federer not ruling out a doubles match-up with team-mate Novak Djokovic. Making his tournament debut, Djokovic joins Federer, Alexander Zverev, Grigor Dimitrov, David Goffin and Kyle Edmund on the Team Europe squad (Jeremy Chardy is the alternate), captained by Bjorn Borg. They take on John McEnroe’s Team World that includes Nick Kyrgios, John Isner, Kevin Anderson, Diego Schwartzman, Jack Sock and Frances Tiafoe, who was a last-minute replacement for Juan Martin del Potro (Nicolas Jarry is the alternate). The teams were presented on Wednesday at Pritzker Pavilion in the heart of downtown Chicago and Friday’s lineup will be announced on Thursday when Borg and McEnroe reveal their picks. Asked about the possibility of playing doubles with Djokovic, Federer said: “I would like to play with Novak, I hope he feels the same way. We are figuring it out as we speak. Internally what the best teams? Because we have a lot of singles guys on the team, last year also Rafa he did play more doubles than us sometimes in the past. I haven’t played doubles since last year, so I’m firing, I won my match last year, so I feel like I’m really confident from that match still. “All kidding aside, we will be practicing our doubles this afternoon, John in case you want to come watch that,” Federer told McEnroe. “The doubles is going to be really crucial as we saw last year. I think they are unfortunately the favourites for all three matches in the doubles and this is where we have to come up with a couple of super teams ourselves. “Having Novak on the team with his momentum winning the US Open for singles is key I think down the stretch maybe, but also in doubles it’s going to help because he is struggling a lot with the return lately,” joked the Swiss. Djokovic, who has won the US Open and Wimbledon in the last three months, was sidelined with an elbow injury last year when the Laver Cup was staged for the first time. “This is event is very unique in many ways,” said Djokovic on Wednesday. “Obviously it’s my debut this year but I was watching it on TV last year and it was very exciting to see a new concept. To see many of the guys that shared rivalries throughout their careers, like Roger and Rafa for example, played on the same side of the court, supported each other. It’s a great team spirit. That’s something we’re missing a little bit [in tennis] because we play mostly for ourselves and our team but it’s mostly individual tournaments. Founded by Federer’s management company Team8, in collaboration with Tennis Australia, USTA and Brazilian billionaire Jorge Paulo Lemann, the Laver Cup is a team event inspired by golf’s Ryder Cup, and it carries the name of tennis legend Rod Laver. It pits two six-player teams against each other, one representing the best players from Europe, and one comprising of the best players from the rest of the world. This year’s Laver Cup takes place at the United Center in Chicago from September 21 to 23. There are three singles and one doubles on each day of the event, over five sessions. A one-set doubles match will determine the winner if points are level on Sunday. Both singles and doubles are best-of-three sets with ad scoring. In the event of split sets, the third set is a 10-point match tiebreaker. Each match win will be worth one point on Friday, two points on Saturday, and three points on Sunday. If points are 12-all on Day 3, a doubles set with a tiebreaker will decide the Laver Cup champion. The winning team must reach 13 points. An exhibition match will be played after the trophy ceremony if the overall winner is decided after Match 9. Each player will play at least one singles match during the first two days. No player will play singles more than twice during the event. At least four of the six players must play doubles. No doubles combination can be played more than once, unless for the doubles decider on Day 3, if points are tied at 12-all. Match-ups will be determined one after the end of each day’s play through the exchange of lineup cards by the captains. The youngsters continue to make a statement on the WTA tour this season as 17-year-old Amanda Anisimova became the first player born in the year 2001 to crack the top-100 this week in the rankings. Despite missing four months of action due to a foot injury she sustained in Miami in March, Anisimova has managed to climb to a career-high ranking of 95 on Monday, thanks to her runner-up showing in Hiroshima last week. At 17, Anisimova became the youngest WTA finalist since Donna Vekic, who was runner-up at Birmingham 2013 at 16 years and 11 months, and at Tashkent 2012 at 16 years and two months. The talented American, who won the US Open junior title last year, is enjoying a rapid rise that saw her claim an impressive top-10 victory over Petra Kvitova en route to the fourth round in Indian Wells earlier this season before making her first WTA final in Japan on Sunday. Now the youngest player in the top-100, Anisimova boasts fierce groundstrokes off both wings with her backhand standing out as a real weapon. Born in New Jersey to Russian parents, she moved to Florida when she was three and continues to train there. We caught up with Anisimova recently in Cincinnati — where she made the third round — to find out more about her. From her favourite player growing up, to her dream mixed doubles partner, the American tells all in her Sport360 Rapid Fire Round (watch above).